Müller-Thurgau thrives in the Trentino mountains. In 1494, a young German painter living in Nuremberg, just married but unhappy, took the opportunity of a black plague outbreak to leave the city, and to leave his wife – at least temporarily. His aim was to explore Italy, the country of the Renaissance, and to study the art of the Italian masters. During this trip, the German painter made many watercolor sketches. He crossed the Trentino region, descending into the villages of Cembra, Faver, and Segonzano. All these places are portrayed in his now-famous artwork, and thus it was with a bit of excitement that — some centuries later — I found myself in the same place: on the bridge of Segonzano, looking towards the town’s famous castle. Just the way he, Albrecht Dürer, did. The only difference was that he was heading to Venice, while I was on my way to a wine tasting festival for Müller-Thurgau. This is, in fact, the most important white wine found in Val di Cembra, a small valley in Trentino which owes much of its reputation to Dürer, a renowned German painter, printmaker, and theorist of the German Renaissance. Even today, tourists looking to discover the same exciting landscape that erstwhile traveler saw can traverse the Dürersweg, (“Dürer’s Path”), two days’ walk from the old hospice of St. Florian in Laghetti di Egna to the town of Segonzano. Setting history aside, I was in Val di Cembra to celebrate a meaningful milestone: the International Festival of Müller-Thurgau’s 30th anniversary – along with the 14th annual International Müller-Thurgau Wine Competition. What’s so special about this wine? Well, understanding the Val di Cembra itself helps clarify. It is a small, narrow valley at the entrance to the Dolomites bisected by — and hollowed into a “V” shape by — the Avisio creek, creating steep slopes. On one side of the valley, the deep green of the woods appears spotted with red; this is where porphyry mining quarries are located. On the other, more than 700 kilometers of terraced vineyards are the plainest evidence that people have been making wine here for centuries, adapting their agricultural needs to a hostile environment. Growing vines here is difficult and dangerous; at some points, the inclines exceed 35%. Nearly all work in the vineyard must be done manually, including harvesting. As a result, yield per acre is quite low, while costs are high. 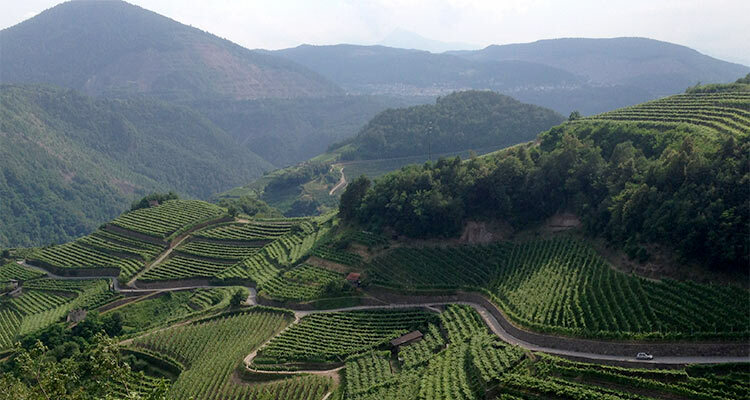 In this charming but challenging environment, more than 988 acres of vineyards are cultivated with small amounts of vernatsch (schiava), pinot nero, pinot grigio, gewürztraminer, riesling, chardonnay and the indigenous lagarino bianco. But the main plantings are Müller-Thurgau. Created in 1881 by Swiss researcher Hermann Müller in the canton of Thurgau, this cross of riesling and madeleine royale grows well even in vineyards located above 600 meters (2000 feet). 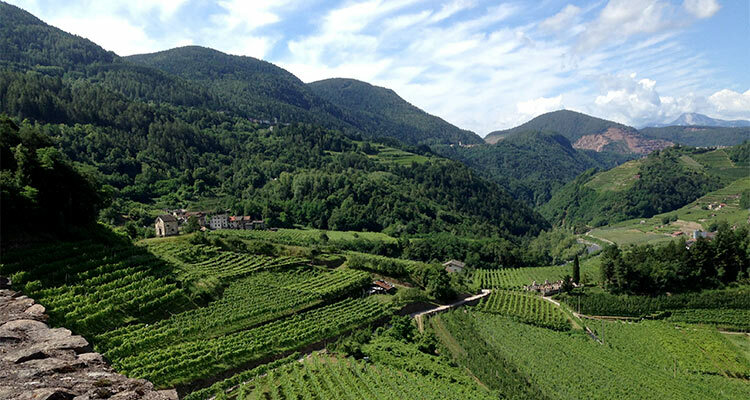 From the highest spot, Bait de le Forche (at 860 meters or 2800 feet), award-winning Vigna delle Forche Müller-Thurgau Trentino DOC, from local cooperative Cembra Cantina di Montagna was born. At that altitude, the microclimate is characterized by strong temperature fluctuations, which give the wine its typical freshness and aromas reminiscent of alpine herbs. Furthermore, depending on where the vines are, the composition of the soil changes. If there is more porphyry than limestone, the result is more austere and elegant, with scents of mint and balsamic herbs, rather than rounded with notes of tropical fruits. One of the best features of Müller-Thurgau is its remarkable flexibility with food. Throughout the festival many outstanding tastings and pairings were organized, with a variety of local foods: fish – especially delicious Golden Trout, typical of this region; cheese made with alpine milk; pork, specifically luganega, sausage seasoned and dried for at least four weeks; carne salada, a fine cut of beef brined with salt, pepper, juniper berries and other spices; and even fresh berries. It’s no wonder people here are proud of their local wines and don’t hesitate to compare them with the best Müller-Thurgau in the world. 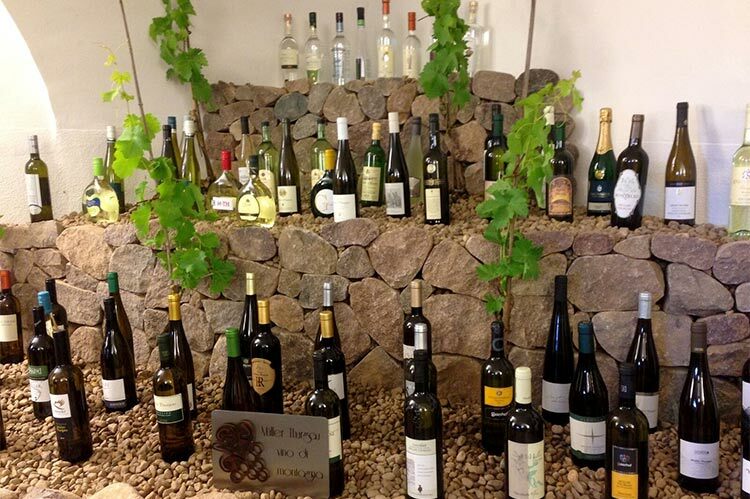 This year, the wine competition included 68 samples, from Italy, Germany and the Czech Republic, and the jury awarded four gold medals and 16 silver medals. Obviously I tasted many of these wines, and below offer notes about several of the most interesting. But my advice is not to settle for buying a bottle or two of Müller-Thurgau; instead, plan a trip to Italy to discover Val di Cembra with a backpack, no matter the season. In winter, with snow all around, it’s even more evocative. 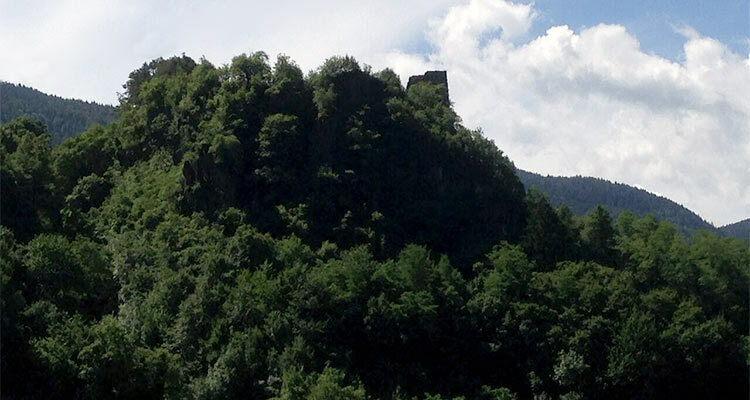 If Albrecht Dürer traveled through here centuries ago, with no plane, car or train, there’s no reason we can’t! Intense aromas, fresh, both floral and fruity with notes of peach and sage. Fruity taste, well balanced with acidity, long and clean. From the highest vineyards in Val di Cembra, a true “wine of the mountain.” Tomato leaf, peach and mint in the nose, ripe yellow apples on the palate, overall elegant and very drinkable. Reminiscent of the white flowers of elderberry, with scents of baking spices (especially nutmeg). Slightly aromatic and fresh, with a balanced structure and length.